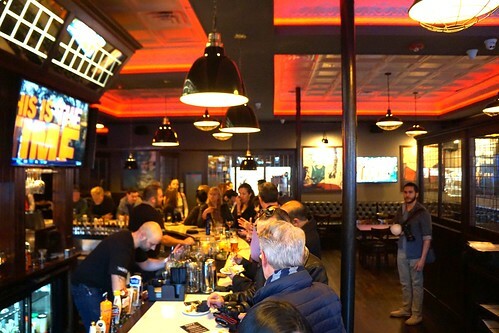 A couple of weeks ago, I joined a group blogger brunch at The Kinsale, an Irish pub right by the Government Center station in downtown Boston. 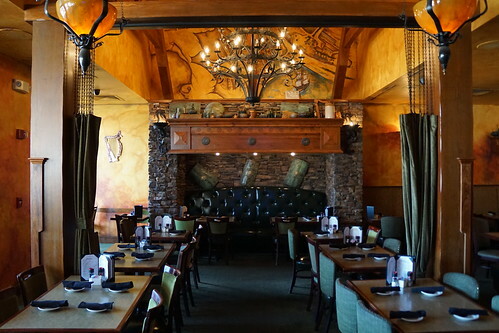 As you can see from the beautiful decor, The Kinsale is a classic Irish pub, but their food menu beyond traditional Irish offerings. While many Irish pubs have an extensive menu, we don't usually equate them with brunch either, so it was fun to check out what they would offer for brunch. Our group started with some French 75, made gin, lemon, sugar, and sparkling wine. 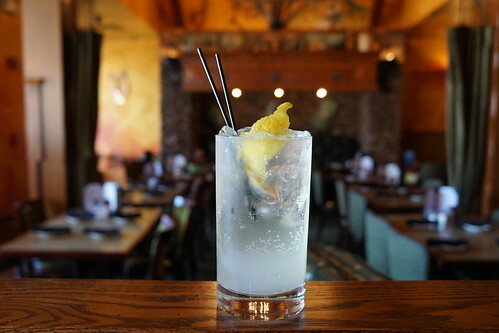 While not traditionally served in a tall glass, it was a well made version of this refreshing cocktail. 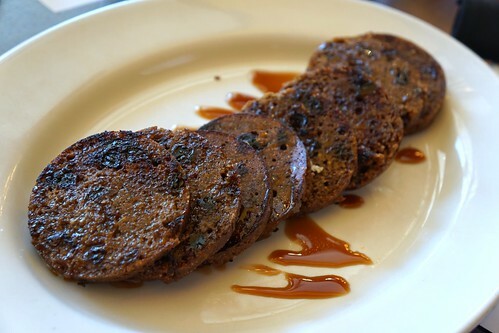 The Boston brown bread is round since it's made by steaming it in a can. Since no yeast is added, this style of brown bread is dense in texture. This is only my second time having brown bread, and I have to say I like it sweetened with the cedar syrup. 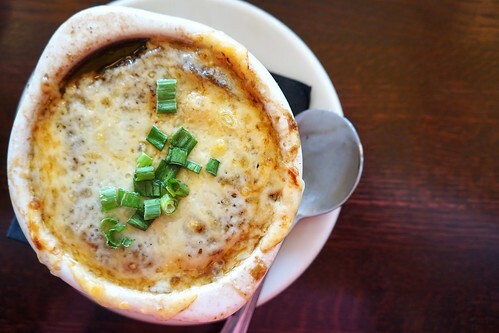 I thought this version of the French onion soup is a fun take that incorporates the Irish pub backdrop using the Irish red ale, and the Boston locale with the brown bread inside the soup. 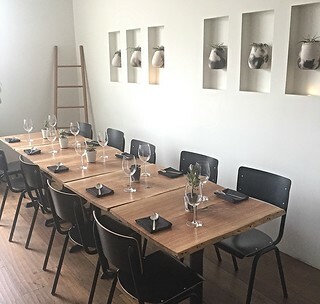 One of the newer restaurants I was excited to try was Neal Fraser's new Fritzi in DTLA's arts district. I've been seeing a lot of instagrams of their rotisserie chicken, and most importantly, waffle tots, aka potato waffles. 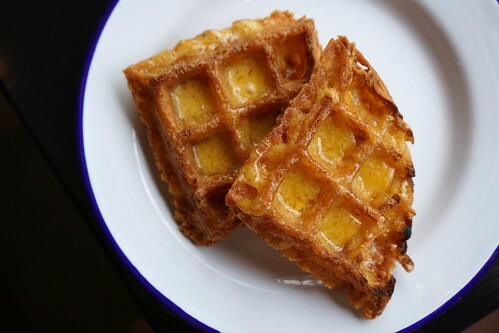 Yes, waffled tater tots. Get it with cheese, always. 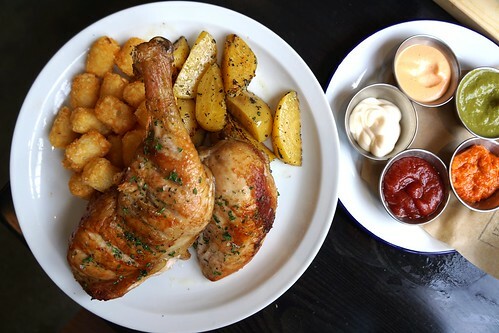 You can order the rotisserie chicken as 1/4 chicken for $15 or 1/2 chicken for $19, and it comes with your choice of fries, tots, or potato waffles, and a choice of vegetables of the day. You can also order one of their dipping sauces starting from $0.50 and includes options like green harissa, black garlic aioli, Louisiana aioli, or Vermont beer-cheddar (I love the harissa). 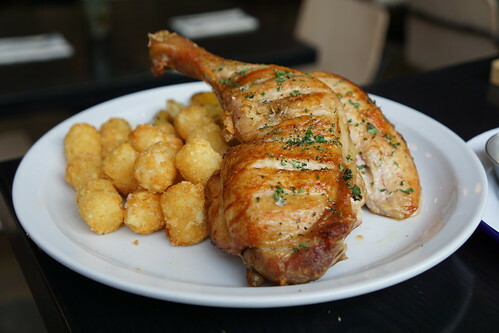 I typically don't order chicken, especially chicken breast, but that's because many times restaurants make them too dry. That won't happen with Fritzi's rotisserie chicken, though, with its perfectly tender and juicy meat. 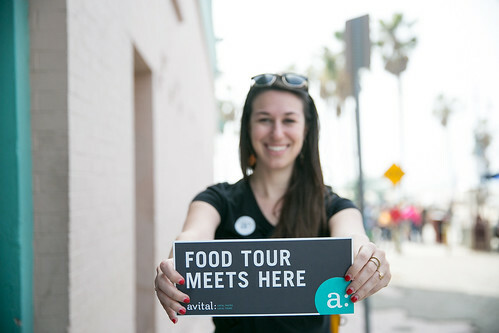 I recently got the chance to check out a one of the walking food tours by Avital, who took us on a tour around the Venice neighborhood. The tour begins with 2 shots of craft beer at Venice Ale House. Located strategically on the boardwalk, you can’t help but watch hipster and westsiders going about with their weirdness. Moving along, we walked couple blocks to one of the narrow alleys to encounter a sleek, minimal storefront called as Dudley Market. After couple of beer shots at The Ale House, I thought we were getting greasy food to wash down the alcohol bloat. 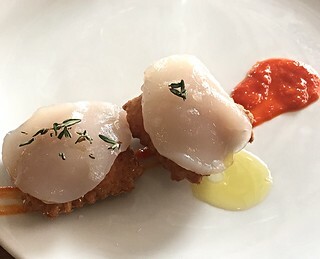 To my utmost surprise, a plate of Puff Pastry with scallop and Calabrian Chili Salsa came to sight within 5 minutes. I pretty much inhaled them with sips of fine Cava. 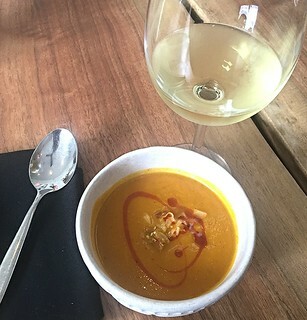 I was amazed with Chef Jesse Barber’s (formerly of Barnyard and The Tasting Kitchen) creation – it’s simple, honest, and ingredient-centric. Definitely not the prototypical dish you’d find on beachfronts. A new Irish bar just opened up in Boston's Brookline neighborhood, but don't expect a dive bar with nothing but Guinness. 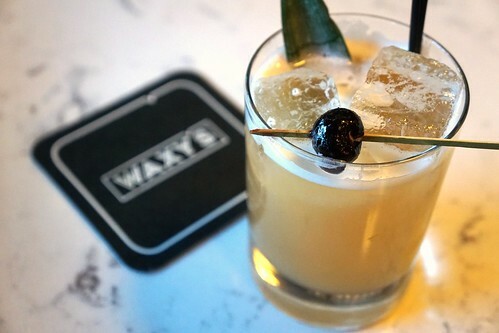 Waxy's Modern Bar + Kitchen is a modern Irish bar concept from Waxy O'Connor's, a departure from their previous old school pubs, and that means great craft brews and cocktails. The name comes form the term "waxy", which colloquially means a lucky event. 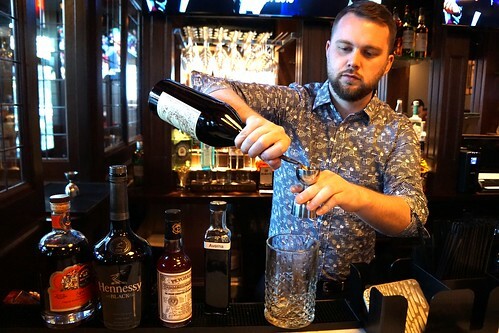 The cocktails and beer list come courtesy of James O'Brien, an Ireland native who learned the trade at New York City bars. Waxy's will feature 40 rotating beers on tap. The beer list is separated by styles (cider, sours, IPAs, etc) and feature breweries such as Founders, Sixpoint, Harpoon, Firestone Walker, Allagash, etc. Not to worry, though, they'll still have Guinness and Magner's. 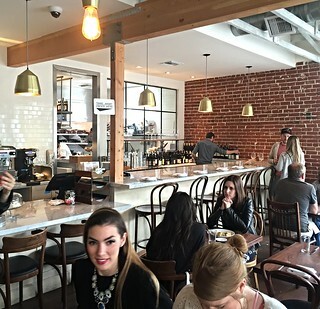 Demitasse has opened a new location in Hollywood, but this one is no ordinary coffee shop. 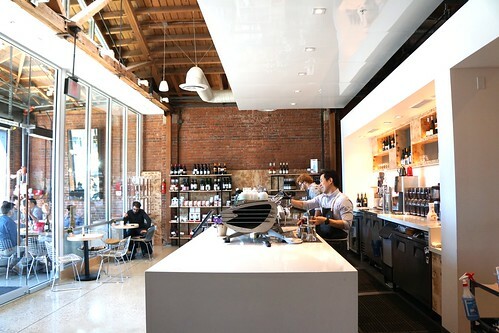 Demitasse Roastery and Kitchen takes cafes up a level with a great food menu and coffee cocktails on top of their already solid coffee program. 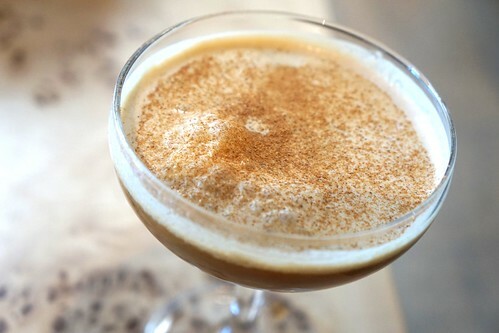 Demitasse has a rotating special coffee drink on the menu at all times. 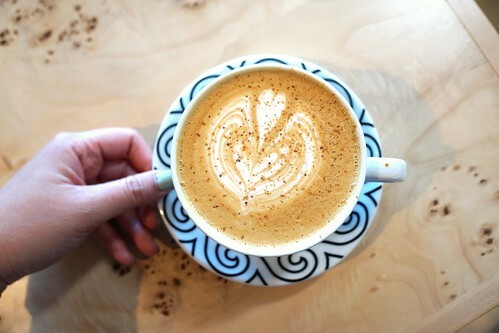 When I came, this was the blood orange nutmeg latte. They've added a housemade blood orange syrup to the latte and grated nutmeg on top. I was initially skeptical how a citrus would work with coffee but this was amazing. The blood orange adds a nice layer of flavor and makes the lattte less heavy. The citrus makes the flavors much more vibrant but you still get the acidity of the espresso. 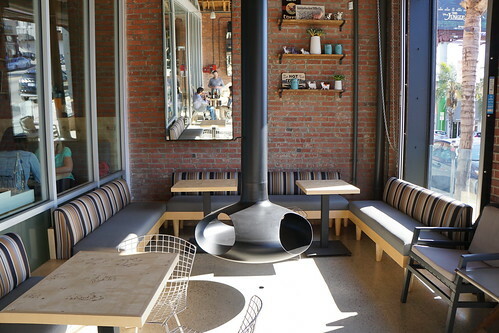 The space is gorgeous, as well, with a bright and airy interior and a great outdoor dining space. 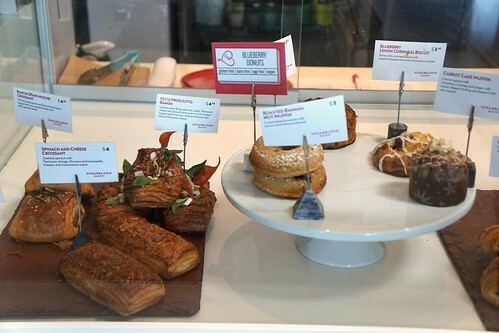 They sell baked goods from the awesome Sharon Wang of Sugarbloom Bakery.